Is your wood deck beginning to look old and outdated? Is the paint chipping and starting to peel? Then it may be time for a new deck. With the great weather we enjoy in South Florida you want to make sure your deck is looking good and in good condition to host guests. At Keys Deck & Dock Supply we have the highest quality PVC decking in Pompano Beach. There are many advantages to OVC decking over traditional wood decks. Wood decks are becoming a thing of the past, and it’s easy to see why PVC decking is preferred over wood decks. Why should I install PVC decking for my home? UV and Fade Resistant- Unlike wood decks, PVC decks don’t fade from the sun. You won’t have to worry about sealing or repainting your new deck when you install a PVC deck. Slip Resistant- PVC decks are slip resistant when they get wet, making them much safer than wood decks. Carefree Maintenance- PVC decks are made from plastic, meaning they require no maintenance. They’re also mold and mildew resistant meaning you won’t have to worry about mold or mildew forming when your deck gets wet. Temperature- We all know that when it’s hot out it can be unbearable to walk on our deck without shoes. With PVC decking, you’ll no longer have to worry about burning the bottom of your feet. These are the major reasons why so many people are turning to PVC decking instead of wood. If you have children, PVC decking is great because it’s slip resistant and you won’t have to worry about your kids slipping and falling when the deck is wet. If you’re looking for the best PVC decking in Pompano Beach, call Keys Deck & Dock Supply today. We’ll help you choose the perfect new deck for your home. 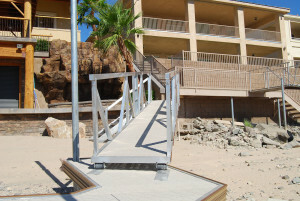 We use the highest quality materials with all of our decks and docks, ensuring your new deck will last. No longer will you have to worry about getting splinters or burning the bottom of your feet when you get a new PVC deck. Call us or visit our website today to get started on selecting the perfect new PVC deck for your home.